Update: Sara of Project Soiree is the winner! 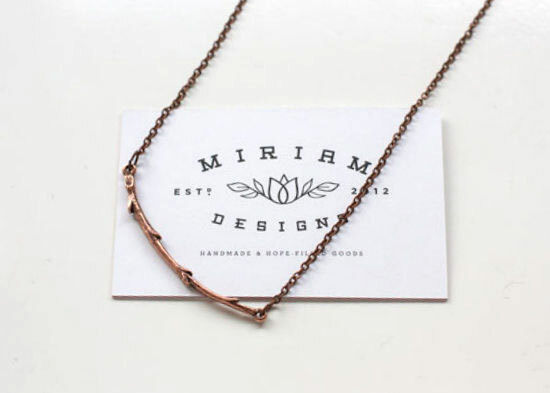 I have a giveaway for you today, but first I want to tell you a little bit about Miriam Designs, the company behind it. The jewelry is made by women in Nashville who have overcome addiction, prostitution and life on the street. Their tagline is handmade and hope-filled goods -- I love that. They create some beautiful pieces, but this sweet little branch necklace called "twiggy" happened to be my favorite. And now you have a chance to win it! Just leave a comment below before noon on Friday, July 19. For additional entries, like Miriam Designs on Facebook and/or add this to one of your Pinterest boards. One winner will be chosen at random. Good luck! I always love things like this--knowing they come from positive energy. I will definitely check them out. Thank you Natalie. This initiative is awesome. Companies like this that offer spaces to be empowered and continue to empower oneself are much more valuable than just charity, I think. I also really like the names of their pieces on their site...thanks Natalie! love this necklace + this company! Liked and pinned... Any company that makes it a point to better their community/city/country and world in general is awesome as far as I'm concerned. I love this necklace and the story behind the women who made it. I definitely want to check out more of their stuff! I love your blog! Very cool company--thanks for sharing! What a great story behind the company. The pieces are really neat, too! Thanks for the chance, the necklace is lovely! pretty pretty! thanks for sharing with us! Really cute, I hope I can enter.Is it an international giveaway? I liked Mariam designs on facebook. What a wonderful company with beautiful items! I want that twig necklace. I liked Miriam Designs on Facebook under my fan page Botanical Curator. I love this! Beautiful design, concept and heart behind the line. I am responding via Wendy at the Young Heart blog. Lovely necklace! I would love to win it! Gorgeous necklace! I love companies that are interested in more than profit – especially as they help show other companies that people and environment are just as important! What a beautiful concept! I love the story and the jewelry is gorgeous! It is so nice to see such a civic minded company following their dreams. 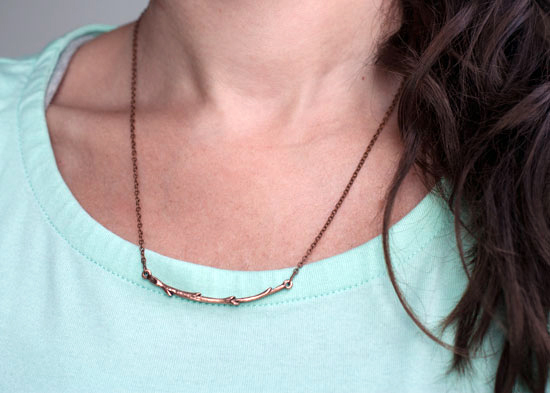 I love simple necklaces, especially layering them!